Reject separator and vibrating screen are both used for screening and removing various impurities, so they have the almost same function. But there are still some differece between reject separator and vibrating screen. 1. It has a stable feed slurry box, which can keep feeding stability. 2. The specially designed blade rotor has great pulp defibering ability. 3. The rotor screw blade can accelerate the tailing pulp running. 4. Using water spray device, improves the fiber recovery rate. 1. It equipped with feeding diluted steady slurry box, ensuring the inlet pulp concentration flow is stable. 2. The sieve plate bottom has gas sealing design, ensuring the machine can self-cleaning. 3. Eccentric rotor under excitation device, ensuring the machine safe and durable running. 4. Screen area equipped with a water spray device, which is beneficial to fiber recycling. 5. It has premium characters in low power consumption, simple operation and easy maintenance. Leizhan supply high quality paper making machine for paper mill around world to produce kraft paper, corrugated paper, culture paper and tissue paper and so on. 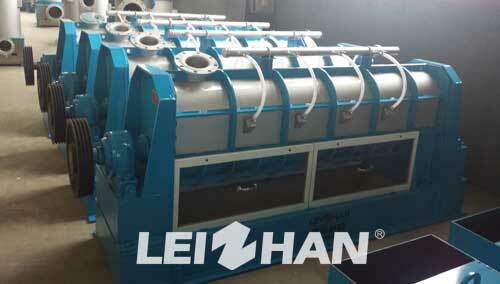 Not only reject separator and vibrating screen, Leizhan also produces paper conveying, pulping, screening, refining, cleaning machine and provides paper machine.